Celebrated host George Noory and David Blume get to the bottom of why prices are rising and why that doesn’t have to be a problem for your wallet or the world. Help us spread the word! Send the link and news and invite your friends, colleagues, family and fellow clean air breathers to TUNE IN for this important update! Western US: 1-800-618-8255 (toll free)? Eastern US: 1-800-825-5033 (toll free)? Wild Card line: 1-818-501-4109 (anyone can call) ?? This program will be available on the Coast to Coast Am archive as well if you miss it tonight. Congressional auditors conclude in new reports that the Environmental Protection Agency faces big hurdles overseeing a U.S. oil-and-gas drilling boom that’s creating “unknown” long-term health risks.?? One of two Government Accountability Office reports made public Tuesday lays out “challenges” facing regulators amid the growth of hydraulic fracturing, or “fracking,” the development method that’s enabling major oil and natural-gas production increases.? ?“Officials at EPA reported that conducting inspection and enforcement activities for oil and gas development from unconventional reservoirs is challenging due to limited information, as well as the dispersed nature of the industry and the rapid pace of development,” the report states. Ford and General Motors Inc. have approved use of a higher concentration of ethanol fuel in new vehicles — a significant victory for the biofuels industry. New GM and Ford vehicles will accept a fuel blend that's 15 percent ethanol, as opposed to the standard 10 percent blend. For GM, that will begin with 2012 models, while Ford will accommodate the fuel in 2013 models, according to Oil Price Information Service, which first reported the news. The auto industry’s resistance to higher blends of ethanol — which it says are more corrosive to older engine models — has long been a roadblock in getting higher concentrations of ethanol fuel blends on the market. Clearing that is important for the biofuels industry, which has said it needs the higher blend, known as E15, to meet a mandate that requires refiners to blend 36 billion gallons of biofuels into traditional transportation fuel by 2022. “The pressure is now on other auto manufacturers to follow suit or explain why they offer substandard equipment,” Monte Shaw, executive director for the Iowa Renewable Fuels Association, said in a Tuesday statement. Oil tanker, 'Oil Movements', reported today that OPEC exports will fall in the four week period ending on October 20. This continues the slow but steady decline in OPEC exports since about the start of August. Saudi Arabia pledged to increase its exports a few weeks or so ago to make up for lost exports from Iran. Since the OM report is forward looking, if Saudi Arabia intended to increase exports, the increase should have already been reflected in this report. LONDON, Oct 4 (Reuters) - Seaborne oil exports from OPEC, excluding Angola and Ecuador, will fall by 370,000 barrels per day (bpd) in the four weeks to Oct 20, an analyst who estimates future shipments said on Thursday. Exports will reach 23.69 million bpd on average, compared with 24.06 million bpd in the four weeks to Sept. 22, UK consultancy Oil Movements said in its latest weekly estimate. The Organization of the Petroleum Exporting Countries pumps more than a third of the world's oil. OPEC left oil output limits on hold at its last meeting, held in June. Aug. 20, 2012 National Corn Growers Association (NCGA) reports: The U.S. Appeals Court ruled on Friday to dismiss a lawsuit against the U.S. Environmental Protection Agency for its approval of E15. The National Corn Growers Association is pleased with the decision and supports the use of E15 for vehicles of model year 2001 or newer. The original suit was filed by petroleum, engine, and grocery trade associations claiming the new ethanol and gasoline blend would cause damage to engines. "Today's decision by the Court of Appeals clarifies the known facts about the safe use of E15," NCGA President Garry Niemeyer said. "This sets the stage for consumers to have more choices at the pump. In addition, the expanded use of ethanol will continue to create jobs and help strengthen America's rural economy." The EPA began testing the use of E15 on vehicles in March 2009. A combined six million miles have been driven and analyzed since the initial waiver. 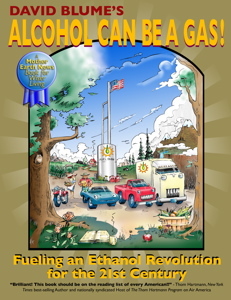 The ethanol industry currently directly employs 70,000 Americans, many in rural America. In addition, the use of ethanol has reduced gas prices by roughly 89 cents per gallon, decreasing the average household's gasoline bill by roughly $800 per year. 3) Help Support IIEA’s work! Are you tired of seeing the Oil Cartel claim bigger and bigger quarterly profits at the expense of our environment and health? Do you believe abundant food, fuel and jobs are our REAL Homeland Security? Good News! You are not alone and you can be a key part of the energy independence revolution! Costs less than 50 cents a gallon to make. Is 98% emission-free and carbon-neutral. Can be used to power transportation as well as cooking and electrical production. Will create permanent non-exportable jobs for Oregon. Tune into the Coast to Coast am broadcast and find out about a special offer for program listeners that will make it easy and money saving to support the Alcohol Energy revolution that is under way all over the world. Please take this opportunity to give a friend, loved-one, colleague, key community contact (or yourself) a gift of knowledge and hope. 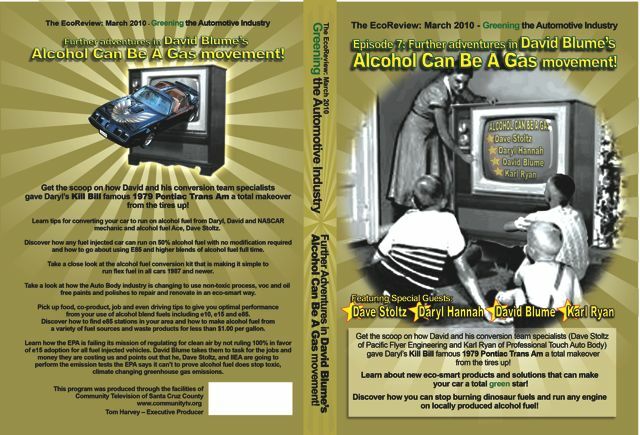 Buy them a copy of Alcohol Can Be A Gas! or one of our new DVD’s. The best present we could give David is having your help spreading the truth about appropriate scale bioethanol’s potential to solve our energy problems for now and the imaginable future. Select from our special offers below. "Brilliant! This book should be on the reading list of every American!!" -Thom Hartmann,New York Times bestselling Author and nationally syndicated Host of The Thom Hartmann Program on Air America?? "Many of the problems we face as a species come from the way we produce our energy. 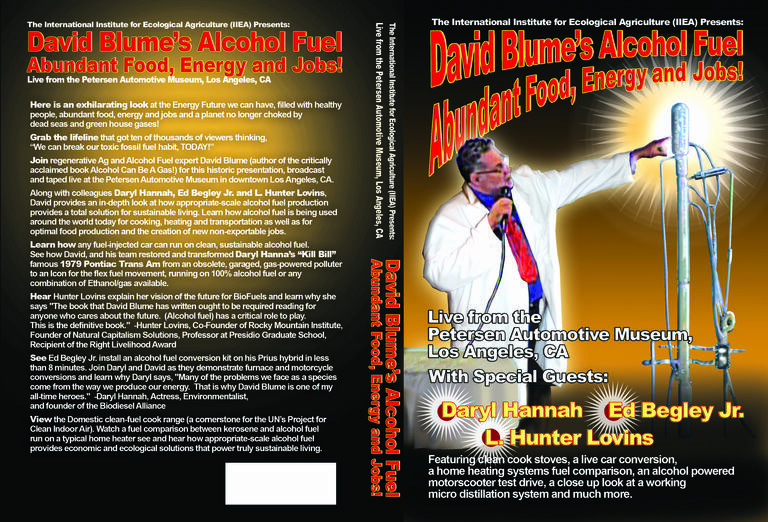 That is why David Blume is one of my all-time heroes." -Daryl Hannah,Actress, Environmentalist, and founder of the Biodiesel Alliance?? We are changing our energy future. Ours is a great journey forward to do so much better with what we have!